There are two exits at the end of each level, the top leaves to a bonus stage. In 1989 Super Mario Land was released for the Game Boy. Instead of taking place in the Mushroom Kingdom like previous games in the Mario series, Super Mario Land is found in Sarasaland. Other differences in this game compared to previous games are the introduction of Princess Daisy as the distressed damsel, the main villain Tatanga, and the majority of the enemies are not related to prior enemies. The last main difference of Super Mario Land to other Mario games is the producer was Gunpei Yokoi instead of the original producer Shigeru Miyamoto. While the differences are there, the game is still full of excitement, and it is just as enjoyable as any Mario game. In other Mario games to end levels, you would reach up for the flag, but in Super Mario Land, that has been replaced with the jumping exercise that involves two doors. If you make it to the top door in the sky, then you move on to a bonus round. Here you can earn shooting power with a flower or extra men. If you fall and do not make it to the top door, then the bottom door will grant you access to the next level in the game. After you have added to your life count in the bonus round, you will go through caves with spiders and tough jumps. Once you have made it through the caves, you then will use Mario to battle in his submarine. At this point in the game you will shoot horizontally for a period and when done, a livid seahorse greets you at the entrance to the third area. Area three takes you and Mario into the future. Robots with head that leave their body to chase you are the enemies and spaceships soar in the background. You will see totem poles and Moai heads are a constant in this area of the game. For transport, boulders bring you to safety over the ground that is full of deadly spikes. In the last area of Super Mario Land, area four, you will find there is a new tune. It is an Oriental themed song, and along with that there is a ninja that can only be smashed for a moment before he returns to normal to attack Mario. Once you near the end, Mario will hop in his place to defeat the villain and rescue the damsel in distress, Princess Daisy. 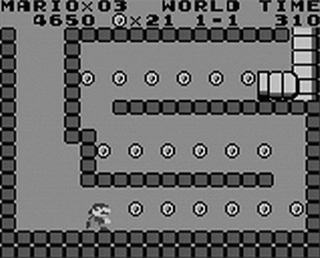 Considering gameplay, Super Mario Land is very similar to other Mario games. 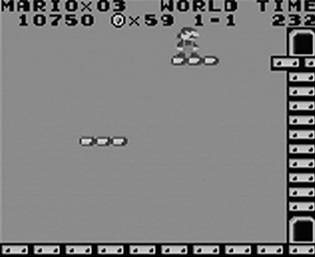 To jump, the A button is used, the B button still makes Mario run faster, and the directional pad directs Mario’s path. If Mario turns into Super Mario or if he is driving/flying, then the B button shoots out shots at the enemies. Jumping on an enemy will defeat it. When you collect 100 coins Mario will earn an extra life, and if you can collect 100,000 coins you will gain another chance to continue if Mario becomes vulnerable with no lives left. A flower will make Mario Superball Mario where he can throw superballs at enemies. The rare starman give Mario invincibility to take on his enemies. The effect of both the flower and the starman are only temporary though. Super Mario Land is an alluring game. It has enough of the old features from previous games to appeal to Mario lovers, but it has newness in villains and tactics to keep you on your toes and hooked. Eliz usually writes at DirectSatTv.com . She enjoys playing retro video games, writing about books, movies, and television.